Yossi Sarid, veteran stalwart of the Israeli Left and former head of the Meretz Party, announced on December 1 that he is retiring from politics. Sarid, a supporter of dealing with Arafat long before Oslo, came to typify those Israelis who closed their eyes to the agenda of Israel's enemies, chose to blame fellow Jews for Arab incitement and terror, and saw concessions aimed at mollifying the nation's adversaries as the answer to existential threats. But initial announcements of his retirement in Israeli media said virtually nothing about his Oslo-era legacy. Representative of that legacy was Sarid's response to the unprecedented terror assault that followed Arafat's arrival in the territories in 1994. Arafat refused to meet his Oslo obligations to crack down on the Islamist terror groups, enlisted Palestinian media, mosques and schools to promote hatred of Jews and rejection of Israel, praised the Islamists and their "martyrs" and urged other Palestinians to emulate them. Yet the leaders of Israel's ruling Labor-Meretz coalition continued to insist that Arafat was a genuine "peace partner." Apologetics for Arafat, encouraged by Arafat's own statements and those of his supporters, included the argument that Arafat could not yet fulfill his Oslo obligations regarding incitement and terror because he had not yet shown his people the fruits of peace and so did not have public backing for a different, more pacific, course. 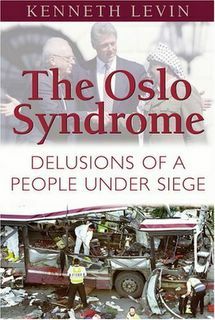 Sarid was among those who took this nonsensical thesis one step further and insisted that the proper response to the increased Palestinian terror was more rapid Israeli concessions, allegedly to give Arafat the credibility he needed finally to end his incitement and public support for terror and begin implementing his Oslo commitments. Israel did persist in its concessions, and, as was obviously predictable, the Palestinians interpreted this as demonstrating the utility of the terror campaign, waged now at virtually no cost to them but only rewards, and the terror increased.Unfortunately, we can see some of the same tortured logic today, as Mahmoud Abbas, Palestinian president now for about one year, has refused to take steps against Palestinian terror and its perpetrators and has done very little to diminish PA incitement to terror and Israel's ultimate destruction. His apologists in Israel and the United States repeat his own assertions that he is too weak to fulfill his obligations regarding incitement and terror and, in the spirit of Yossi Sarid, urge Israeli concessions to allegedly strengthen Abbas's hand and allow him to act more forcefully. An illustration of this was the Rafah agreement pushed into effect by Secretary of State Rice, which opened the border between Egypt and Gaza with no effective controls against infiltration of terrorists and their armaments. In its wake, terrorist leaders have entered Gaza and an upsurge in anti-Israel violence seems inevitable.